Come join us at our next district event, Alington’s Laserpalooza September 15/16th on Lake Arlington hosted by Arlington Yacht Club. Seabrook Regatta a Windy Success!! 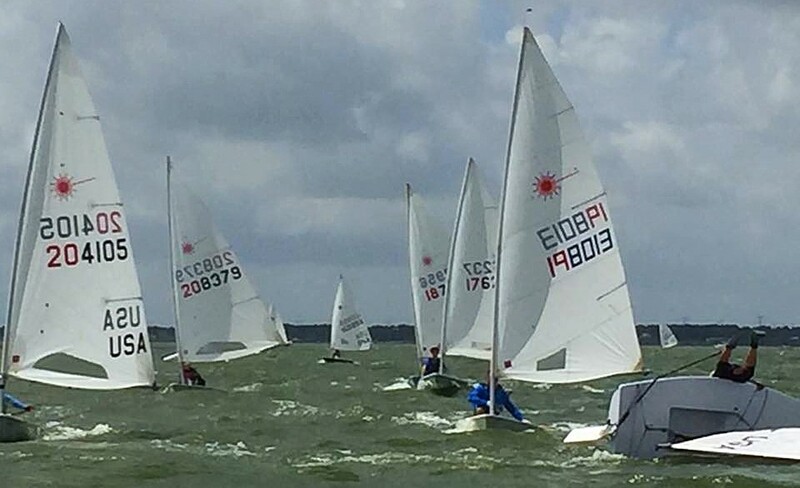 Dallas Sailors made their way to he a Seabrook Summer Solstice on Galveston Bay this past weekend to sail in exceptional conditions against some of the top sailors in Texas. In attendance from DLF were Griffin O, Alex G, Tim P, Christof B, Eric R. On day 1 conditions were winds from the south at 15-20 with 1-3 foot waves which provided some very exciting reaches and downwind legs offered by the Olympic courses. Wipeouts were a plenty across the fleet, with those able to sail a clean race all but guaranteed a top half finish. Day 2 was much the same with two more Olympic courses with some more drastic shifts that made no lead guaranteed. There were a few incidents, however, with Christof cutting his leg on day one which put him out of commission for the rest of the regatta. (Infections are to be avoided at all cost on Galveston bay). Alex showed up with a tiller extension that looked like a banana and despite calls from competitors to find a better one, he proceeded to sail out and break it in half on the last leg of the first race!! Lastly Griffin was sailing out to the racecourse on day two when his gudgoen fell off. Thankfully, he was able to sail in and fix the issue before making it back out to make the second start with 3 minutes to spare! The Lake Conroe Spring Fling is fast approaching on April 28/29th. Please see the Latest NOR below! Excellent sailing, camping, and company will be found at this event! See y’all there! 2018 Easter Regatta Results and Pictures are Up!! The D15 Laser Sailors had an Absolute Blast at this years Easter Regatta hosted by the Austin Yacht Club and the Easter Bunny himself! NOR for the 2018 Austin Easter Regatta is UP!! The NOR for Fred Schroth’s Easter Regatta is out!! Get planning/practicing for our second district regatta!! Registration for the Lake Conroe Spring Fling is Up! Registration for the Lake Conroe Spring Fling is now up!! Check it out here: http://conroeyachtclub.com/race/registration/. The regatta is going to be held on April 28/29 at the beautiful Conroe Yacht Club!! Make sure to attend this great event, followed two weeks later by the Seabrook Summer Solstice, NOR coming shortly. The early morning chill cut through the foul weather gear sending a chill to the bone. It is winter in Dallas and this day would be overcast with a moderate South wind. White Rock Lake was waking up slowly to the cool weather and moderate breeze. The long board boat pad would soon see a lot of activity this cold winter morning. But now in the early morning darkness the warm glow of the Club House lights and the propane heaters offered the only respite from the stabbing chill. Warm meals were being prepared. Oatmeal, breakfast tacos, hot coffee, tea and hot chocolate were made ready for the intrepid sailors. Later in the day the feast would continue with warm pasta and later the best homade hot chili! They began to trickle in sleepily shivering against the sharp cool edge of the steel grey morning. This weekend February 4th and 5th The Dallas Laser Fleet and the Corinthian Sailing Club hosted the First 2017 District 15 Laser Circuit Regatta on White Rock Lake. The First ever Rock the Ice Laser Regatta 2017, added just recently to the D-15 Event Calendar, was a spectacular event in every respect. The event attracted 21 Laser Sailors from the Dallas area including three youth sailors. The weather could not suppress the energy and expectation of sailing a Laser on White Rock Lake. The food would prove to be amazing. The sailors were feted to 9 races and 5 warm meals including a phenomenal homemade chili – and the unveiling of Leeward Gate Brew house’s first two incredible kegs! The weekend would offer challenging wind conditions with moderate and variable breeze on Saturday and very light winds on Sunday. The talented race committee was able to get off 6 very fair races on Saturday and 3 more on Sunday. The course selections were an excellent combination of windward Leeward, W2 ½ and even a couple of Olympic Courses. The start lines were sized to perfection and also square despite the shifting White Rock winds. The entire fleet was aggressive from the very beginning and yet managed to avoid any general recalls. There were 4 different race winners in the Full Rig Class. The Radial Rig Class and Junior Class were dominated by Rachel Mittman. She collected a perfect set of first places in all nine races – quite an achievement! The Full Rig Class was won by Doug Peckover with his worst finish of 6th being dropped. He earned an even balance of 1st and 2nd places to win the regatta. He was pushed hard by former collegiate sailor and Optimist dinghy stand out Griffin Orr. He was consistent in always finishing in 4th or higher, including two 1st finishes and a 2nd. Mike Rist skillfully sailed into 3rd by consistently finishing in the single digits. The Sailors were lavish in praise of the Corinthian Sailing Clubs talented Race Committee’s professionalism and effortless race management. More praise was offered for the delicious warm meals – oh that Chili was so good that 3.75 gallons of chili disappeared by Sunday afternoon. We look forward to 2018 and a larger fleet. Thank you to the numerous volunteers and valued advisors. This was a regatta to attend! Sail Flat! Sail Fast! Sail Downwind! Sail Lasers! District 15 2016 Standings are Posted! Congratulations to District Full Rig Champion Griffin Orr, Radial Champion Charlotte Rose, and both Iron Men, Forest Atkins and John Oliver! Please click Here for regatta information and pre-registration for the Palacios Cannonball Run! Looking forward to seeing you all there this year as the first Regatta of the Fall Season!